To minimize Fusarium impact on crops the first thing growers need to do is a pre-harvest scout. Unfortunately, if there’s already Fusarium in your fields, there’s really nothing you can do to rescue your crop from it. Careful harvesting, drying and storing techniques can maximize grain quality, though. The farmer who piped up was right. The first step to reducing Fusarium impact is to harvest early. 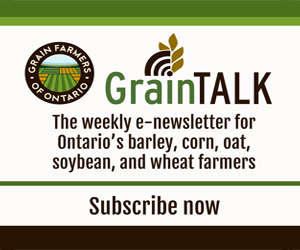 “Anytime grain is over 19% moisture, fusarium can grow,” says Johnson, “so the quicker you can stop that potential spread, the better.” Harvest should begin as soon as your combine is able to thresh, but beware that if moisture levels are above 18%, some combines will have difficulty blowing out the lighter, damaged kernels. “And consider adjusting the cleaning sieves to a more wide-open setting,” he continues. “This directs the air blast vertically, slowing the rearward movement of the grain mass and aiding cleaning and separation.” If the cleaning sieves are open, though, be careful to keep the wheat heads and straw pieces out of the grain sample. To reduce the amount of material on the cleaning sieve, reduce your combine’s speed. Slower speeds also allow the good kernels more time to separate from the infected ones. Finally, use heat to dry grain with moisture levels higher than 16%. Keep in mind, though, that the maximum recommended air temperature for drying milling wheat is 60°C with non-recirculating batch dryers, recirculating batch dryers and cross-flow dryers. With parallel-flow dryers, don’t go above 70°C. The maximum recommended air temperature for drying seed wheat is 40°C. Agricorp recognizes that Fusarium damage is a major concern for producers. Growers can be protected through Production Insurance and AgriStability. Reports are already coming out of south western Ontario where wheat harvest is just beginning, says Chief Inspector and Senior Industry Specialist Jim Zavitz. They expect to receive more in the coming weeks as harvest continues. AgriStability also protects customers when their reference margin falls below 70% due to factors like lower market prices for feed grade wheat. Customers can apply or interim payments once they are six months into their fiscal year.